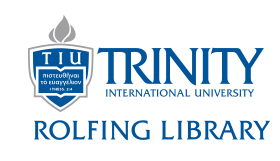 Using WorldShare, distance students may request scans of items from Rolfing Library and from other libraries. For example, you may request an article from a print journal, an essay from a book, or an entry from a reference book. 1. When searching in a database, first look for links that say "full-text," which means the full article is available online. If there is no full-text link, click on the link that says "Find it" to see if it is available in print or online in another database. 2. If you are a distance student, you can request the article if the journal is available in print or microfilm in the library. If the journal is not available at Rolfing Library, you may also request it, and the library will request a scan from another library. 3. Click on the link that says "Request through WorldShare." 4. You will log in to WorldShare using your TIU log in and password (the same you use for your e-mail and MyTIU). 5. If you used a database, the article information will automatically be entered into the form. If you have a citation to an article, you can also fill out a form yourself in WorldShare (see below for instructions). 7. When the article arrives, you will receive an email in your TIU email. Then go to WorldShare to download the article. 3) Click on the button for "scan." 4) Complete the required fields, including your Trinity username (ex. zjsmith) and the "Need Before" date. 6) You will receive an e-mail letting you know that your article is available, and you will be able to access it through your WorldShare account.